This group of properties are on a site which once belonged to Eton College. In 1498 they were given as an endowment to the College, together with land in the fields. The land, farmstead and house were leased out to substantial farming tenants but in 1800 the College sold the property. 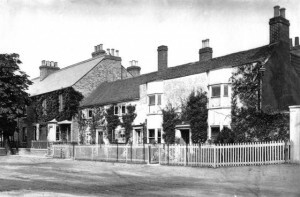 John Goodwin bought the farmstead he had been leasing (now Hall Court) and John Nash bought the houses he had built on part of the farmstead (now Rose & Chestnut Cottages, the Pharmacy, the Old Bank and Bank House). 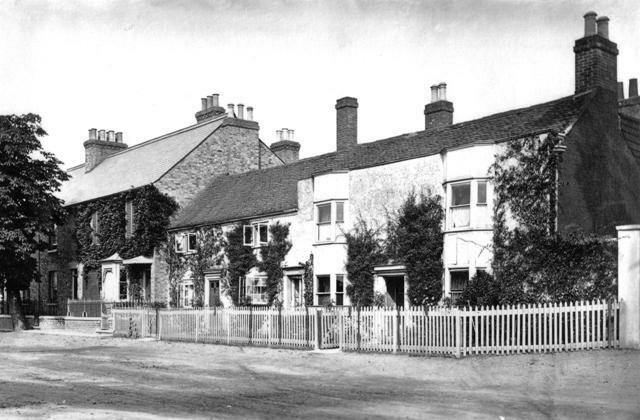 There was originally a third cottage next to Rose and Chestnut Cottages. 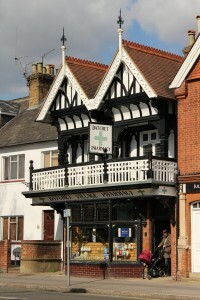 It was called Tring Cottage but was given a dramatic new facade in 1904 to become the Pharmacy as we now know it. Maps show these three cottages were built after 1840. Rose Cottage’s name was first listed in the 1881 census and Chestnut Cottage’s in 1891. The two older and lower houses in the photo were demolished for the Bank and Bank House to be built. One of them had been a baker’s shop run by Mr Aldridge in the 1820s. 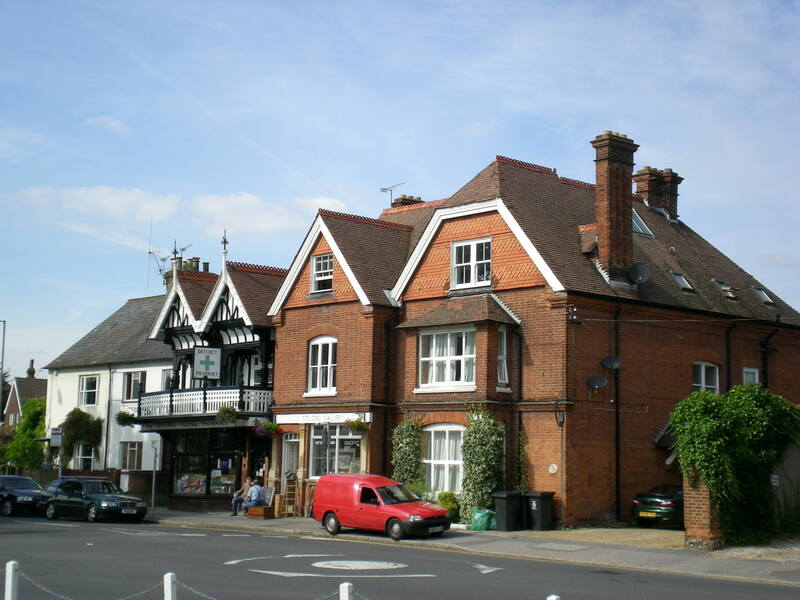 The village pharmacist Arthur (Pip) Willcocks bought Tring Cottage in 1904 when the lease ran out on his High Street shop, and the 1910 valuation survey recorded that he had spent £300 on alterations, which must have included its exceptionally fine mock-Jacobean facade. 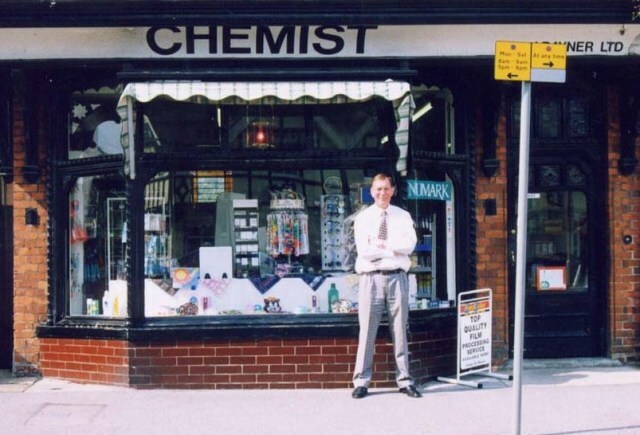 The more recent history of the building and business has been contributed by Roger Walmsley, who was the village pharmacist from 1962 until 2000, at first working alongside his father George. 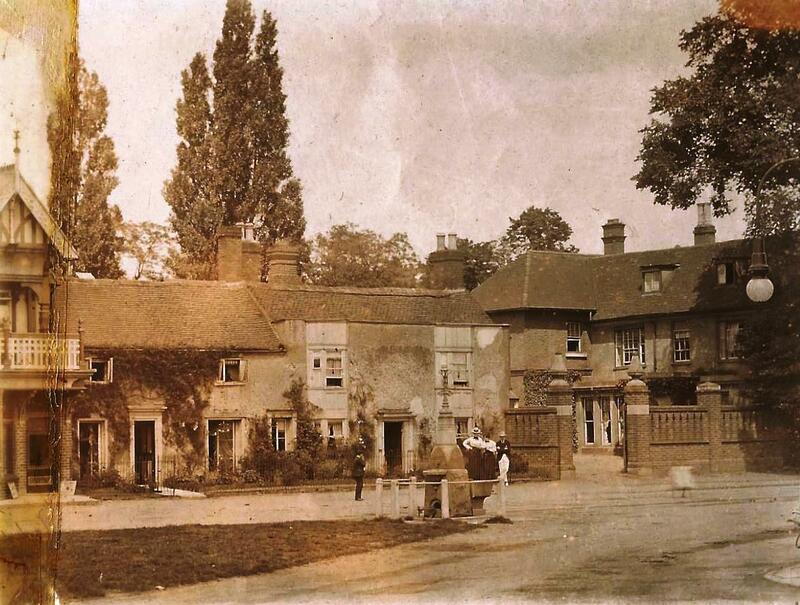 In 1934 Charles Rayner, owner of a Gerrards Cross pharmacy, took a lease on No. 2 Club Buildings (just past the Queens Road level crossing) as a surprise gift for his apprentice, George Walmsley (my father), and his daughter, Jacinthe. The two of them ran a combined pharmacy and hairdressing salon there. Jacinthes hairdressing business was at the back of the pharmacy. They called their company Jacinthe Rayner Ltd., which is still the registered name of Datchet Village Pharmacy. Now there were two pharmacies in the village. Arthur (Pip) Willcocks, a dignified, morning-suited figure, was still running his one in the building on the Green which still houses the village pharmacy. He was not pleased to have a competitor. When the newcomer, George Walmsley, decided it would be courteous to introduce himself, the indignant Pip saw him coming and hid behind his pharmacy screen. He refused to see or speak to George, never relenting although they were fellow pharmacists in the village for the next six years. 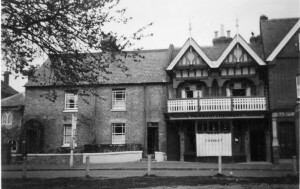 In 1940 Pip Willcocks sold his pharmacy on the Green to William A.Herbert who went on to found the Cross and Herbert pharmacy chain. Datchet was his first pharmacy. Then in 1956 George Walmsley bought Herberts pharmacy on the green and moved Jacinthe Rayner Ltd to its present premises. By then the company’s only real connection with the Rayner family was its name. Jacinthe had married before the war and moved to a farm in Southern Rhodesia (now Zimbabwe) to raise horses. 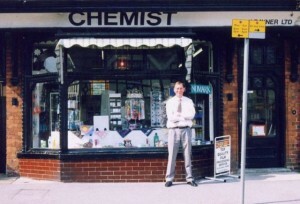 I qualified as a pharmacist myself in 1962 and became a partner in the pharmacy that year. My father continued to work part time in the pharmacy until he was over 80, and then in March 2000 I sold the pharmacy to Simon Carter. After studying pharmacy and optics at Manchester University, my father began his working life in 1926 at the Gerrards Cross pharmacy where the owner, Charles Rayner practised as a dentist, optician, faith healer, spiritualist and homeopath as well as a pharmacist. His pharmacy boasted a portable x-ray machine alongside a large tin bath used to ferment a mixture of various roots dug up (often by my father) from Gerrards Cross Common. The resulting brew was perfumed with rose water and sold as hair restorer which people travelled from all over the south of England to buy. In the early years of my father’s pharmacy at Datchet, most medicines were made by hand but he restricted himself to manufacturing more orthodox cures. Like all his contemporaries, he made pills, powders, suppositories, mixtures, ointments and creams. The present owner of the pharmacy, Simon Carter, has a fine collection of the antique gadgets used in their manufacture on display in the pharmacy. Unlike most children growing up during World War II, I was not deprived of sugar. Pharmacies were copiously supplied for the making of medicines. My mother helped me to impress many young friends with her memorable sugar sandwiches. Sugar may have been plentiful but drugs were primitive by todays standards. There were no antibiotics to treat infections until the late 1940s. My father was also an optician, supplying spectacles to the people of Datchet until the 1970s when he felt that he was no longer sufficiently up to date with modern practice. His retirement was a great disappointment to many elderly people in the village because he had never charged modern prices for his glasses. Pharmacy has changed over the past 50 years from a practical science to a more academic, advisory role. Now many medicines are dispensed in calendar packs with advisory leaflets. The pharmacists job is to explain the effects and side-effects of these potent treatments. During my 40-year span as a pharmacist in the village I have known the pharmacy with three different looks. The beautiful Victorian mahogany fittings were removed in 1960 and replaced with then modern self-service fittings. The year 2000 has seen another dramatic change, the shop area has been increased in size and brought into the 21st Century with the latest designs and new technology.